Go solar with our fastest solar oven. Bake, roast or steam a meal for two people in minutes, reaching up to 290°C. The Sport™ sets the bar for portable solar ovens. Easy To Use:Unfold, load with food, point towards the Sun and relax. Portable: Folds into a slim 3.4kg package. Perfect for RVing, camping or just relaxing at home. No fire hazard here. Cook from 360° without hotspots. Just load your food, set a timer, and relax. Perfect for children! Perfect for fishing and RVing. I can just pop it open, load it up, and it cooks while I "work". It was surprisingly delicious! Flavors come out richer than normal. My favorite way to cook vegetables! Everything you need to cook like a Pro with your GoSun Sport. Sunlight is focused by the compound parabolic reflectors onto the tube, heating the inner cooking chamber. The vacuum tube acts as a near-perfect insulator, converting more than 80% of the Sun's rays into useable heat. The heat inside mimics that of an oven, building up to a staggering 550°F/ 280°C! GoSun does not recommend boiling water in the Sport directly against the tube. Especially for boiling water we have designed the GoSun Brew, our water boiling insert for the GoSun Sport®. 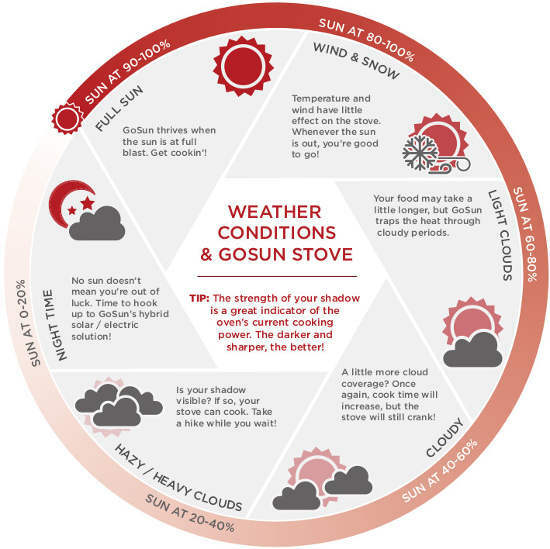 Many foods will finish cooking when the internal temperature of the food hits near 100°C in the GoSun oven. This means that steam is a strong indicator of a dish's progress. Noticing smell is another easy and surprisingly intuitive way to judging your food's progress, just make sure not to burn your nose! Give it a couple tries and you'll be a pro.